What do you do when you have several bananas that are perfectly ripe and on the verge becoming too brown? Obviously, you bake something!!! Yes, of course, you can bake banana bread (which I absolutely LOVE). But how about something slightly different? 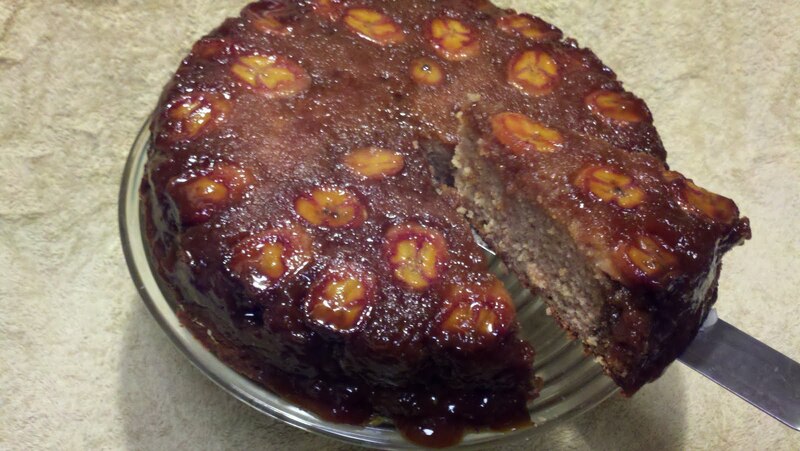 Everyone loves a delicious pineapple upside down cake, so why not do it with bananas instead? It's so simple to do and I PROMISE you that the banana lovers in your life will love you for it. If Cathy's family hadn't rescued me, I probably would have eaten the entire thing. It's so yummy and moist and sticky and gooey! Oh, and it's also perfect if you don't need to feed a huge mob. It makes a little one layer cake that is perfect for a small group. Hmm...I wonder if you can double it and bake it in a 9x13 pan....who knows??? Maybe I'll try that soon. In the meantime, give it a try. If you like banana bread, you'll LOVE it! Lightly grease a 9-inch springform pan and wrap the outside bottom of the pan well with foil (this will prevent caramel from leaking later). In a small sauce pot or microwave-safe bowl, melt together 6 tbs butter and corn syrup. Stir in brown sugar. Whisk until smooth. Pour mixture into the prepared pan and spread evenly. Slice peeled bananas on the diagonal, making each slice approx. 1/4-inch thick. Arrange in a single layer in the brown sugar mixture on the bottom of the pan. Set aside. In a large bowl, cream together butter and sugar. Beat in the eggs one at a time, followed by the vanilla and cinnamon. In a small bowl, stir together flour, baking powder and salt. Add in the flour mixture in two or three additions, alternating with additions of milk. Pour batter into pan and spread evenly, ensuring that all banana slices are covered. Bake for 80-90 minutes, until a tester inserted into the center comes out clean and the cake springs back when lightly pressed. Once the cake is out of the oven, run a knife around the edge of the pan to loosen and turn cake out onto a serving platter while still hot. Cool to warm or room temperature before serving. Store any leftovers covered in plastic wrap. If you don't have a springform pan, you can easily use a regular 9" layer pan . Just grease it well with baking spray or butter and flour. Then, just to be sure your bananas and caramel don't stick, line the bottom of the pan with a piece of parchment paper which has been cut to fit the pan. Then grease the parchment. I PROMISE you it will come right out of the pan. The best time to enjoy bananas is when the peel is yellow with tiny brown specks. If the peel is still a little green, it's not quite ripe yet. If the peel has huge brown spots all over it, it's goin' downhill fast. You can still bake with the bananas that are over ripe, but it's probably best to choose a recipe that calls for mashed bananas instead of a recipe where you want the bananas to hold their shape. Btw, When I made it, I only had two bananas, so I wasn't really able to completely cover the bottom of the pan. The next time I make it, though, I'll absolutely use 3-4 bananas. More is More! !